You know when you read about the ‘stunning beaches’ of the Greek Islands and you think it is just marketing jargon? 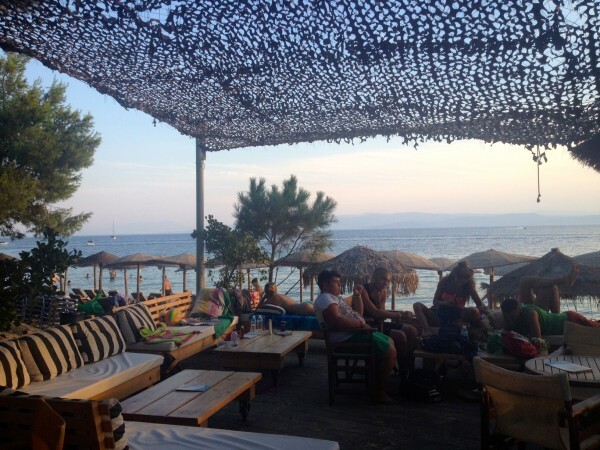 Skiathos proves you wrong. This ‘Aegean Paradise’ surprised and impressed me in many ways, but none more so than with its numerous and consistently beautiful beaches. Following the one main coastal road from the airport in the east to Koukounaries in the west, you could pull into any cove and feel like you had found a piece of paradise. So we hired a jeep and did exactly that. Update: I’ve just returned to Skiathos for a second visit. 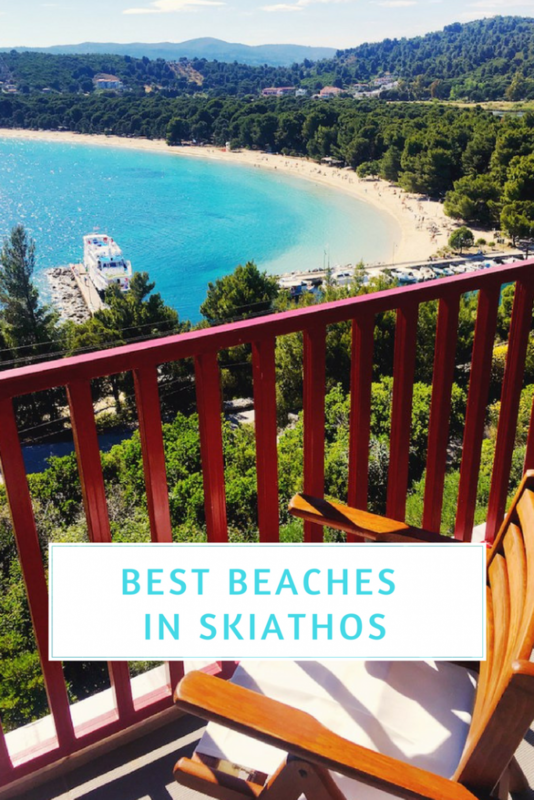 Find my updated Skiathos Travel Guide here. 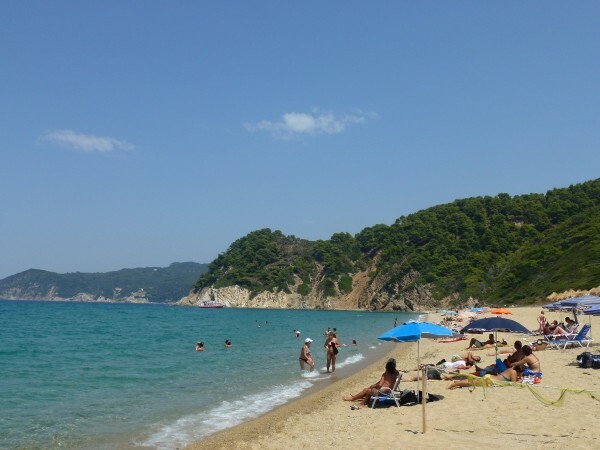 The first beach we came across was Agia Paraskevi. It wasn’t our local beach, Vromolimnos was, but we hadn’t yet spotted it hidden over a hill from where we were staying. Paraskevi was a great find, however, because you can tuck into a delicious Greek Salad on the beach at the Skiathos Princess Hotel. Just along from Paraskevi is Troulos. This small cove with just one restaurant looks out onto a tiny island which the more active can swim out to. 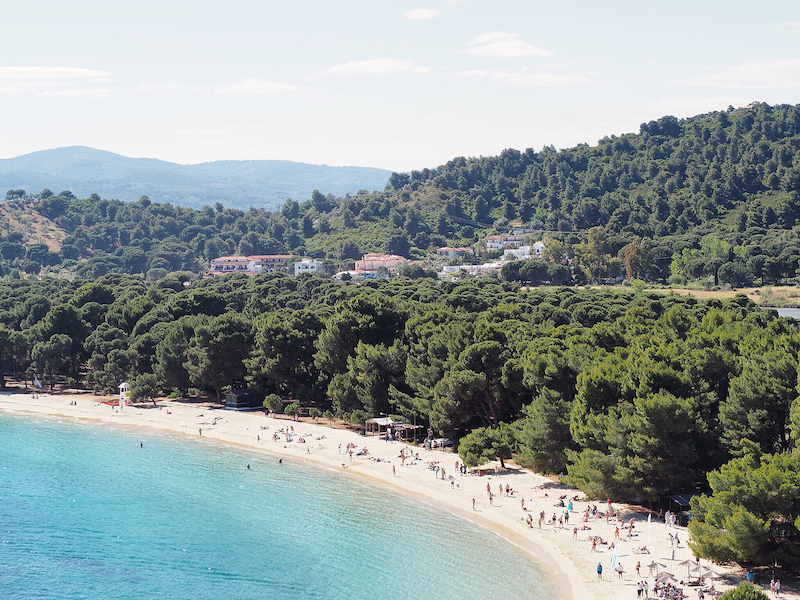 The most famous of Skiathos’ beaches is Koukounaries, mainly for its long stretch of perfect white sand backed by vibrant forest. With popularity, however, comes people and although the sand was the purest on the island, I found the back to back sun-loungers a little too much. 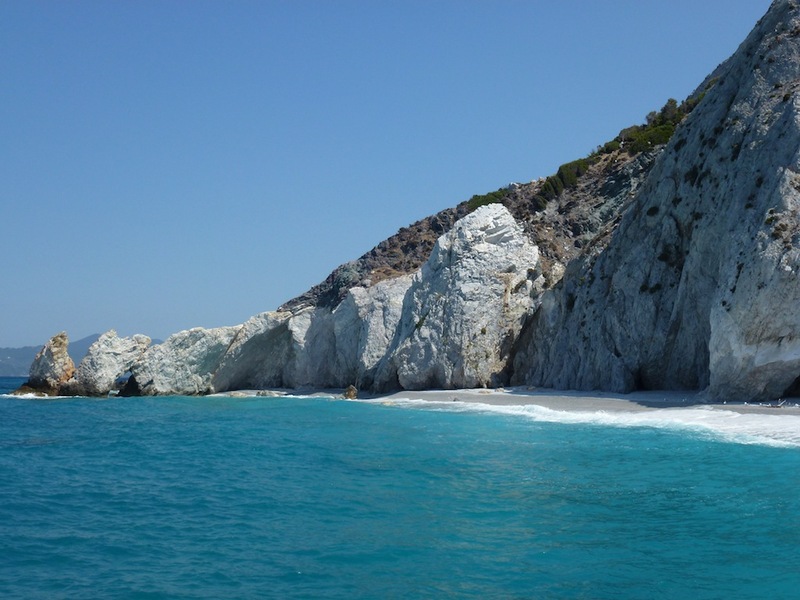 My favourite beach was just past the ‘party beaches’ of Koukounaries and Big and Little Banana – Agia Eleni. The island bus only goes as far as Koukounaries so Eleni is only accessible by car or boat. This made it feel a little more private and the bathers were definitely more local. The sand sloped gently into the clear ocean, which was the temperature of a comforting bath. On the shore was one restaurant and the Tropical Beach Bar, where we spent a lot of time. Cushions and low tables were laid out under a straw canopy, so you could recline with an iced coffee within splash reach of the ocean. With the jeep we could venture a little further off the main road. One day we attempted to visit the very far north of the island by road, following the signs to Kastro. Big mistake! There are many mountains and dirt tracks between the 2 coasts and it got quite hairy at some points. There is one beach that can only be reached by boat, but it is not to missed. 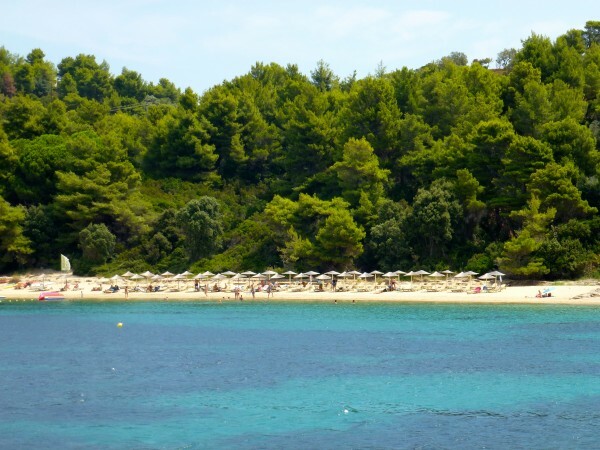 Lalaria will turn up in almost every brochure of Skiathos and for good reason. White cliffs, pristine pebbles and a reflection that turns the water the most intense shade of turquoise – words cannot justly describe it. A one day boat trip will take you around the island stopping at all the best beaches including Lalaria. Boats depart daily from the Old harbour in high season and prices start from just 10 euros. Bigger boats make the journey over to Skopelos for Mamma Mia fans. 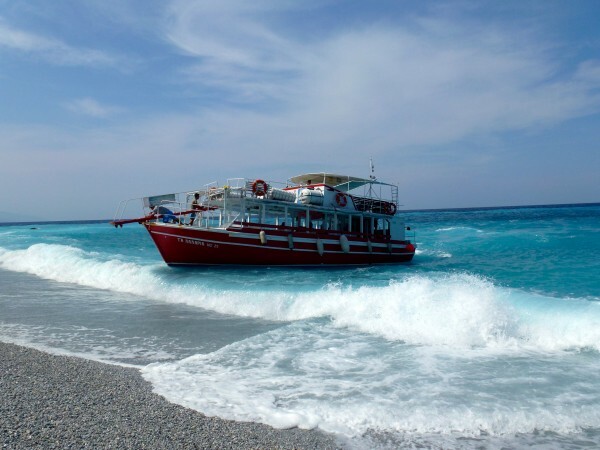 If you are not a fan of longer boat trips the neighbouring island of Tsougrias was also used for filming and can provide some Hollywood-esque picture perfect opportunities. When we did finally make it over the hill to our closest beach, Vromolimnos did not disappoint. 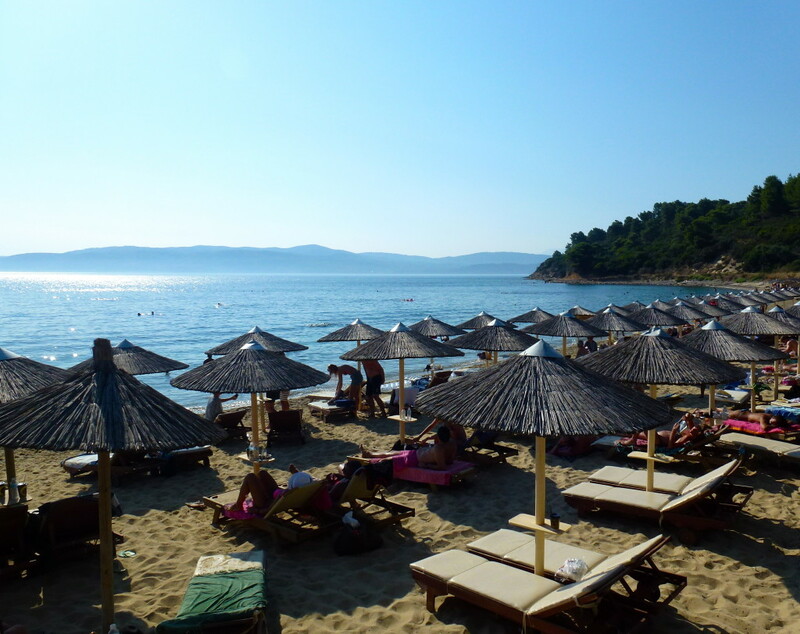 A short, narrow strip of sand meant there was only room for two rows of sun loungers and gave the bay an exclusive air. This was reinforced by the very chic Porto Paradiso bar and restaurant which overlooked the water. With the DJ pumping the tunes from early afternoon, the Paradiso waterfront couches were the perfect place for sun-downers. As the sun slowly lowered behind the hills, we watched the sky transform from cobalt blue to tropical tangerine. The sunset cast a simmering spell across the calm water and led to this magical moment. Hi Donna, We were given a paper map with Agia Eleni marked on it when we hired our car, or if you don’t want to drive you can walk there from Koukounaries – it’s signposted from the road. Google maps gives you an idea of the distance. Boats from Skiathos Harbour also stop there. 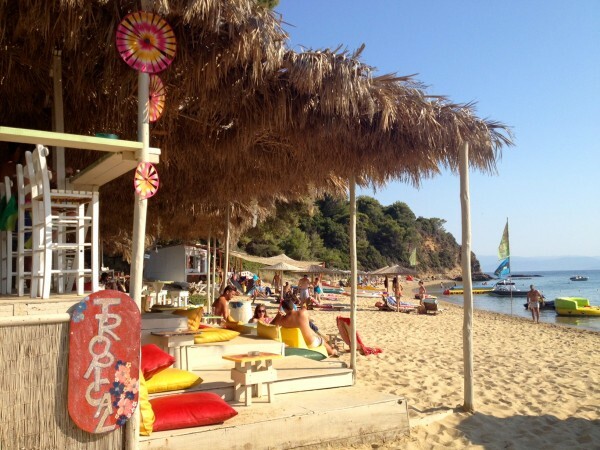 I have to throw the beach at Kastro in to the mix of best beaches in Skiathos. I love it . 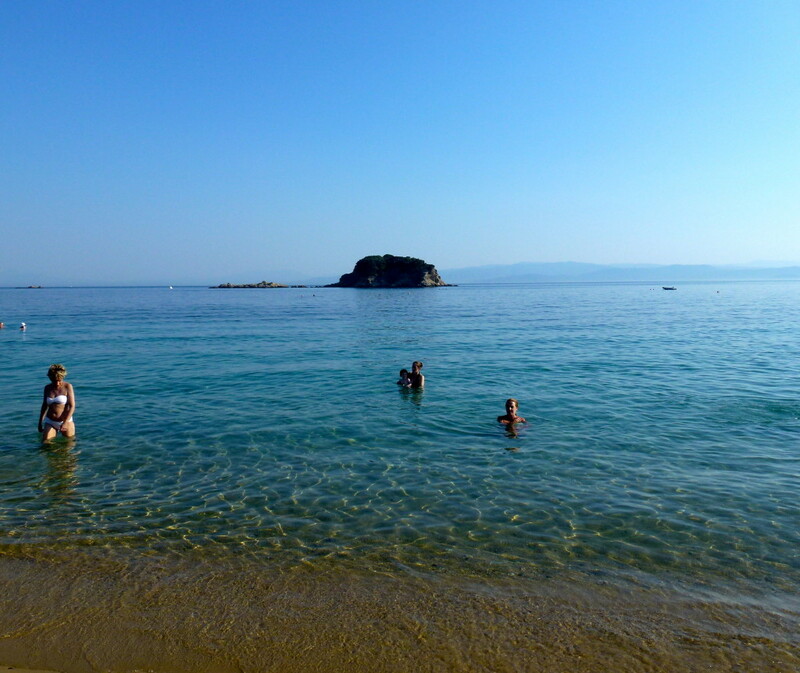 Last summer I spent 2 weeks on Skiathos, check my blog post http://thetravelexperiences.com/beaches-skiathos/. My favorite beach wisas Banana Beach. Banana is not characterized only by party! 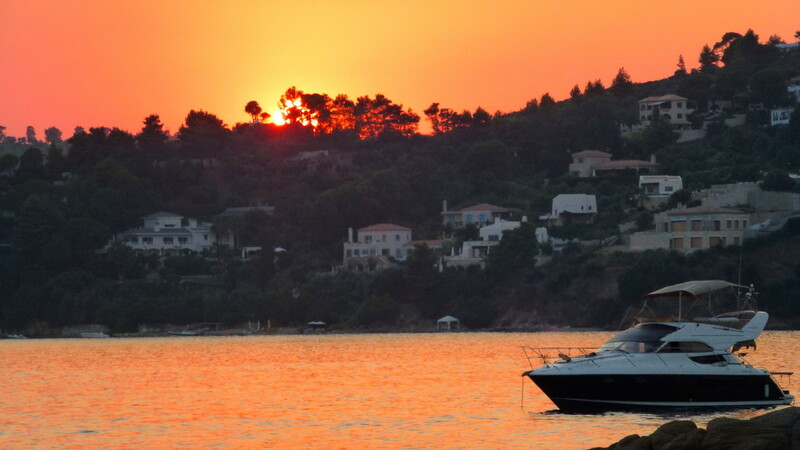 Since it is located on the west side of the island, you can enjoy perhaps the most beautiful sunsets on the island! So, bring your camera to capture the moment!